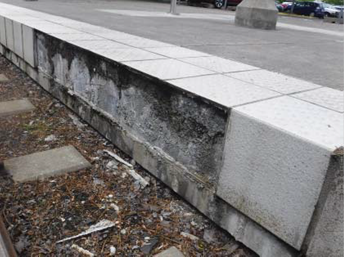 Starting Monday, August 13, TriMet will kick off a multi-year improvement project to replace the white safety tiles at all of our MAX Blue and Red Line stations. The bumpy tiles make up a strip along platform edges warning riders that they are close to the trackway. This is very important to their safety, especially as trains pull in and out of a station. The new tiles will be more durable, create a safer environment for riders, and are easier to maintain. 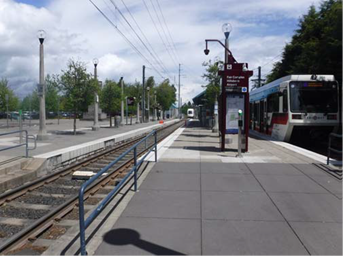 We’ll begin the improvements at our Fair Complex/Hillsboro Airport MAX Station. The work will have minimal impact on riders and will not affect MAX service. There’ll be some demolition happening including saw-cutting and jackhammering. Work hours will be 8 a.m. to 4:30 p.m. during weekdays only. No night work is planned. The improvements at Fair Complex Station are expected to take about a month. When work is done here, we’ll move on and replace the tiles at other stations along the MAX Blue and Red lines. As this will be an inconvenience at times, we thank riders in advance for their patience. The technical name for the white, bumpy safety tile is “tactile paver”, also referred to as “detectable warning surface”. They’ve been required by the Americans with Disabilities Act along the edges of rail platforms since 1991. The pavers were originally designed to warn those with visual impairments of upcoming danger. They were invented in Japan in the 1960s. TriMet is committed to making transit better. We are working to improve the overall rider experience while growing our network of buses and trains. That means increasing service for less waiting at stops and less crowding on board, and adding more connections to jobs, school and other community services. Meanwhile, ongoing upgrades to vehicles, stations and tracks are helping to improve safety and reliability while making the ride more comfortable.